The Smach Z handheld gaming PC was first announced back in 2015 via a Kickstarter campaign. There were some initial production problems and the device had to be postponed indefinitely, but in early 2018 things were looking up again, as Smach released updated specs and a pricing scheme. 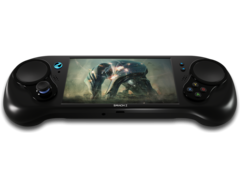 Meanwhile, Chinese company GPD already released its Win and Win 2 handheld gaming PCs that come with better specs, so Smach’s impatient Kickstarter backers demanded more updates. It looked like Smach could finally deliver in early 2019, but now the company says the devices will be available in 2019, with no clear date mentioned. To keep things hyped up, Smach recently released videos showing how games perform and how easy it is to use the intuitive controllers. The games presented include demanding titles like GTA V and Firewatch, platformers such as Cuphead, Nuclear Throne and Downwell, plus classic strategy games like Age of Empires II HD, Star Craft II and Civilization VI. While many modern games are optimized for controllers as well as for mouse and keyboard, it is interesting to note how Smach’s implementation of Valve’s Steam controller is handling RTS games.